Located on SE Division St between SE 122nd Ave and SE 124th Ave, Extra Space Storage serves Portland residents near Mill Park, Powellhurst-Gilbert, Centennial, Montavilla, and more. Locals will recognize our facility next to Shell across from The Division Center. Are you a college student in Portland who needs self storage close to campus? Extra Space Storage is about 3.5 miles from Multnomah University, so we're a great option! With a large selection of storage units, climate-controlled storage, drive-up access, and exceptional security, Extra Space Storage on SE Division St is your go-to storage partner in Portland near Mill Park! Units at our Portland storage facility are available in sizes 5x5 to 10x30 with indoor access, first-floor access, elevator access, and drive-up access. We have the perfect storage space for you! Store belongings with peace of mind at Extra Space Storage! Our SE Division St storage facility is equipped with 24-hour video surveillance, security access to your floor only, and electronic gate access. When storing temperature-sensitive items in Portland, climate control or heated storage is recommended. Climate-controlled units stay between 55 and 80 degrees year-round, while heated units ensure your storage environment stays consistently warm when temperatures outside drop. Units with drive-up access offer the ultimate convenience. Simply pull a vehicle up to unload and load large, heavy items. This amenity is great for anyone using self storage while moving! When you choose Extra Space Storage, you can expect dependable self storage and great service. Our friendly, professional team goes above and beyond to ensure our facility is always clean, well-maintained, and secure. They're also more than happy to help with whatever you need. 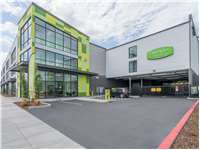 Contact us today to reserve a storage unit in Portland near Mill Park!